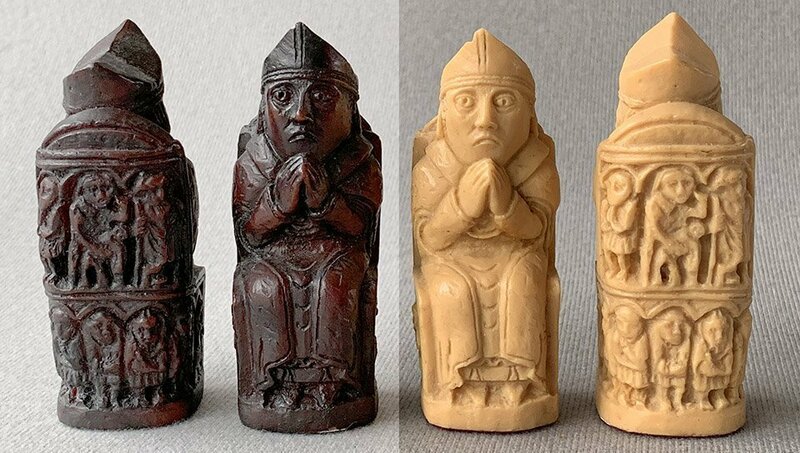 These Reproduction Medieval Chessmen are a variation on the Isle of Lewis Chessmen theme, cast in brown and ivory stone resin. This is the largest variation of the original Isle of Lewis chessmen made. The tallest piece, the King, stands 4-5/8″ tall with a 1-5/8″ long base. 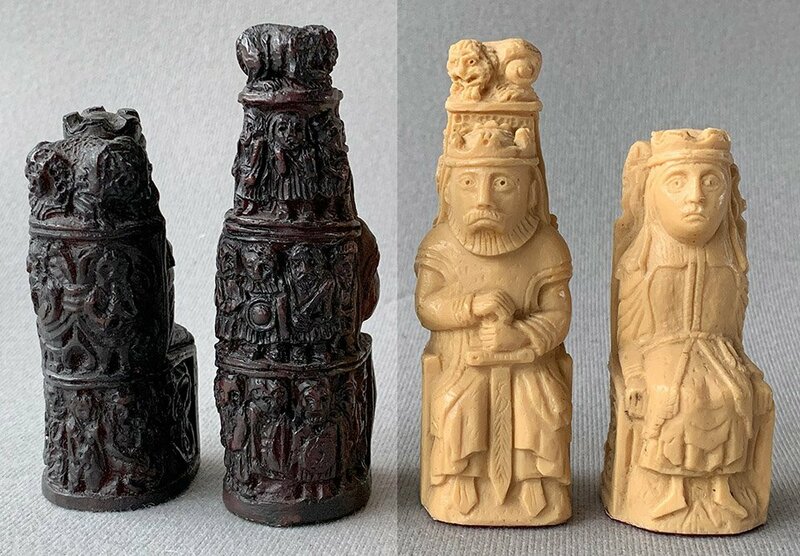 These Lewis Style Medieval chessmen are much larger than the typical Lewis Chessmen currently sold and has very well articulated Pawns in a style not seen on other variants. The chessmen are naturally heavy and rest atop felt base pads. 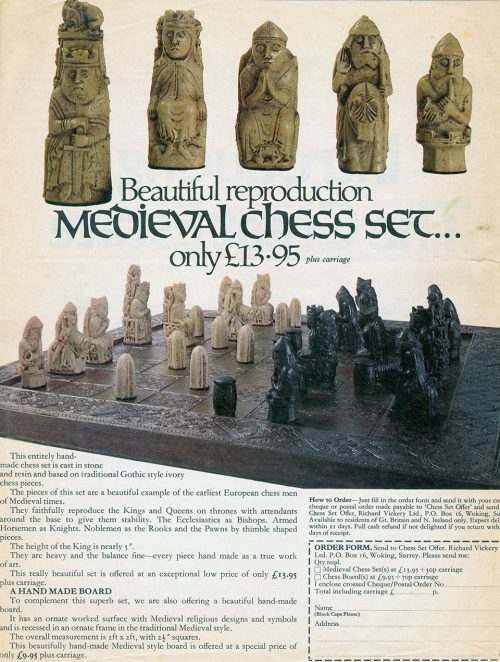 The Lewis Style Medieval Chessmen were offered by Richard Vickery, Ltd. in the early 1970s and were likely manufactured in the United Kingdom. Originally the chessmen were offered with an optional Medieval chessboard. A copy of an advertisement is shown in the image gallery. The chess pieces are housed in a replacement box. These chessmen will require a chessboard with 2-1/4″ squares. A complete selection of our fine vintage and modern chessboards can be found here. 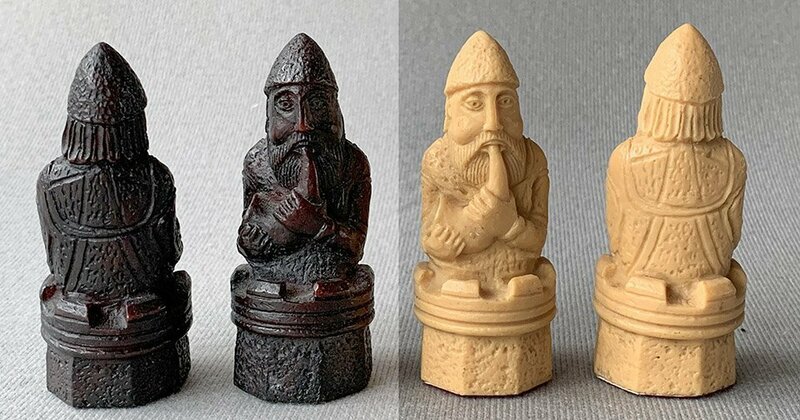 The Lewis Chessmen are the most important chess pieces in history. Ever since the ivory pieces were discovered sometime before 1831 on the Isle of Lewis in Scotland’s Outer Hebrides, these kings, queens, knights, rooks, bishops, and pawns carved from walrus tusk and whale tooth have long fascinated us due to their exquisite craftsmanship, unusually evocative faces, and strikingly Norse character. Today 82 of the 93 known pieces are in the British Museum, and the remaining 11 are at the National Museum of Scotland in Edinburgh. Despite their fame, some key details about them remain unknown. Here are 12 facts we recently learned about the Viking ivory chessman. Most are found in Nancy Marie Brown’s new book Ivory Vikings: The Mystery of the Most Famous Chessmen in the World and the Woman Who Made Them, which draws upon Icelandic sagas, archaeology, history, and forensics to locate the chessman in a time in history when the Norse ruled the North Atlantic.